The death of cells or tissue. In laryngology, necrosis is seen most commonly after radiation therapy to the larynx for cancer treatment. Radiation kills the tumor but at the same time damages the blood supply of normal tissue on a permanent basis. Necrosis in this instance is called “radionecrosis.” Or, necrosis could result from trauma (a physical wound) that disrupts blood supply, or occasionally in the context of ulcerative laryngitis, which seems to necrose the superficial layers of the vocal cords. Necrotic tissue typically sloughs off down to viable (living) tissue. This man underwent supraglottic laryngectomy and radiotherapy nearly 20 years ago. A biopsy was done some years later elsewhere, and triggered radionecrosis. Hyperbaric oxygen treatments back then saved the day. 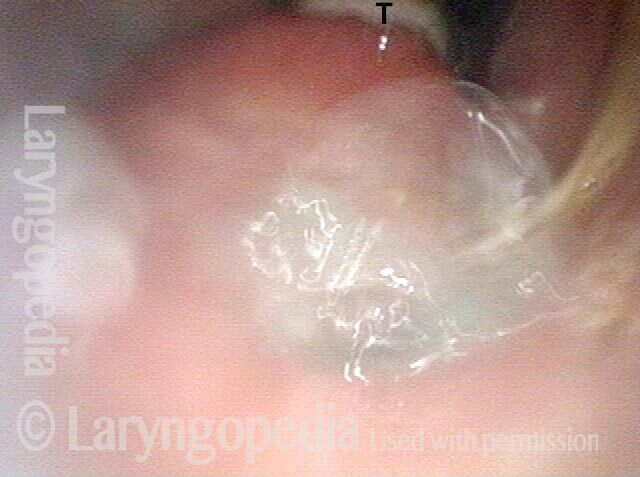 This larynx has continued to lose function slowly over time, necessitating tracheotomy, and with deteriorating voice quality. The latest problem is coughing on liquids, and they are coming out his tracheotomy tube. Here, you see the arytenoid apices (each marked with A). Epiglottis and false vocal cords are surgically absent. 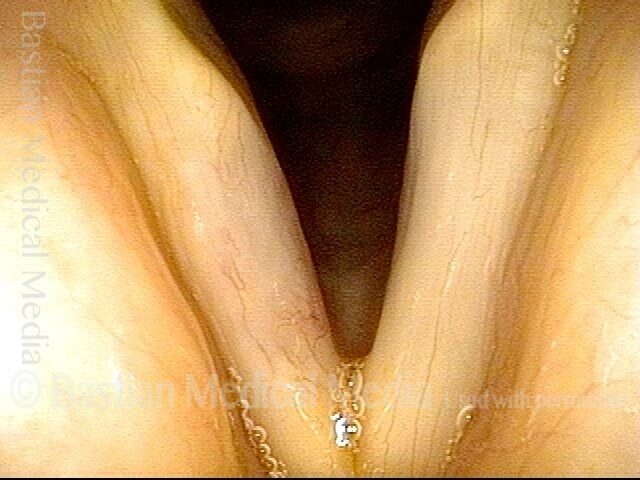 Base of tongue (BoT) was pulled down to the level of the vocal cords. Click to enlarge this photo to see the dots marking the upper surface of each cord. 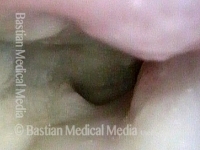 Now looking deep into the surgically-minimized laryngeal vestibule, the two larger dots are again on the vocal cords, for comparison with photo 1. The fine dotted line encircles a fistula. When the patient swallows, food or liquid can enter in the direction of the arrow. Where it goes next is seen in the following photos. Remaining in the anterior subglottis while the patient swallows pale blue-stained water, you see a part of the bolus “exploding” through the fistula, and this series of 4 photos taken together fully explain why this man is having so much difficulty with liquids that he swallows coming out his tracheotomy tube.